HOW SAFE IS OUTPATIENT COSMETIC/PLASTIC SURGERY UNDER GENERAL ANESTHESIA? Some of my Orange County plastic surgery patients are worried about general anesthesia. This is a legitimate concern, but needs to be put in perspective. A recent review published in Plastic and Reconstructive Surgery, arguably the most recognized journal of plastic surgery in the world, found the risk of death from out patient surgery to be approximately 1 in 50,000 patients. 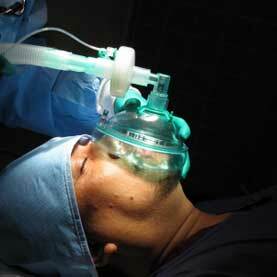 Assume a plastic surgeon performs 500 cases a year under general anesthesia (this equates to 42 cases per month). I do not know of any plastic surgeon who operates that much. It will take this plastic surgeon one hundred years to reach 50,000 patients! As one can see, the risk of death from general anesthesia is very low. In comparison, the risk of death while driving is 1 in 5,000. There fore, a person, on the average, has a ten times risk of dying while driving than from general anesthesia. To achieve this low risk, however, requires the patient to be healthy or have a medical condition(s) which is well-controlled, the surgery center is accredited and either a board certified anesthesiologist or CRNA is administrating the anesthesia. Of course, the surgeon must be well-trained and safe as well. I hope this will put your mind at ease when going under general anesthesia! PreviousPrevious post:HOW LONG DO BREAST IMPLANTS LAST?NextNext post:COMBINING PROCEDURES IN PLASTIC/COSMETIC SURGERY-WHEN DOES IT MAKE SENSE?